WHILE THE MEDIA IS TRANSFIXED ON THE MUELLER REPORT, who is watching our schools? Read Jeanne's take on staying focused - in an age of endless distractions - on the issues that matter the most to families, communities, and country. “Perhaps we need a Mueller Report for education,” says our Founder & CEO. MEDIUM STATE - BAD IDEAS. New Mexico’s newish Governor Michelle Lujan Grisham comes from a long line of well respected leaders from the land of Enchantment. Her pedigree has many scratching their heads and this disenchantment over her Secretary of Education messing with the state’s leading charter school which far surpasses the traditional district on all measures. 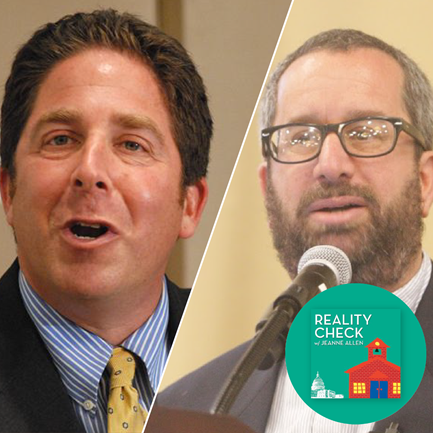 Learn why Mission Achievement and Success (MAS) Charter School has to turn its attention and resources to political battles in this week’s Reality Check live this Wednesday. MOTHER KNOWS BEST. As you might recall, a committee of the New Hampshire House had voted to end a long running scholarship tax credit, creating a fury among parents for whom the program was a life saver. Reminding those short-sighted legislators that their ideology-driven jihad against empowering parents and students has real-world consequences, the mother of an 8 year old with special needs simultaneously tutors the lawmakers and takes them to the woodshed. Legislators - moms know what’s best for their kids! THE HOTTEST EVENT ON THE PLANET. Join us at the ASU+GSV X the most dynamic, cross industry, ed tech event you’ll ever attend. Founded by Arizona State University’s dynamic president Michael Crow, and the team at Global Silicon Valley (GSV) the premier venture capital fund investing in cutting edge entrepreneurs in the $75 billion education and talent technology sectors, the the 10th annual ASU+GSV Summit will explore the Arc of Human Potential, from “preK to Gray.” Are you ready? IS EDREFORM THE NEW BLUE? And if not, why do the leading foundations overwhelmingly fund organizations to allegedly do education reform that are mainly run by Democrats? (When it’s clear that innovation and opportunity are non-partisan issues??) This week’s episode of Reality Check with Jeanne Allendelves into the controversy surrounding a new report by AEI’s Rick Hess, o and Jay Greene, of the University of Arkansas, “Education’s Deep Blue Hue.” Is political correctness stalling out reform efforts across the country, even as local communities and educators struggle to achieve their goals? Tune in to this episode of Reality Check for a fascinating discussion. MOTOR CITY SCRIBES WRITE IT RIGHT. Detroit is known as one of the most dysfunctional cities in the country, which makes a recent editorial in the Detroit News all the more noteworthy. “A damning new study dispels the myth that more money is the cure for education’s failures”. We couldn’t have said it better ourselves. As they say at the Saran factory, that’s a wrap. As always, your comments and suggestions are most welcome.